Britain’s leading business lobby group will say there is no “credible alternative” to EU membership on Wednesday amid government plans to hold a referendum on leaving the EU by 2017. Sir Mike Rake, president of the Confederation of British Industry (CBI), will tell an elite audience gathered at the group’s annual dinner that Britain should seek to reform the EU rather than leave it. Rake is expected to encourage the UK’s top bosses to “speak out early” and “turn up the volume” about the benefits of EU membership. Cameron has pledged to hold an “in-out” referendum on Britain’s membership of the EU by the end of 2017, but some have predicted the vote will take place in 2016. However, a pro-EU think-tank has warned against rushing the vote, arguing Britain has a better chance of reforming the union if it takes its time. “There are some who are urging to bring the vote forward, to try and achieve a quick win — this has its dangers, however,” Raoul Ruparel, Open Europe’s head of economic research, said Monday. “The faster the deal, the less likely there is to be big reform,” he said. 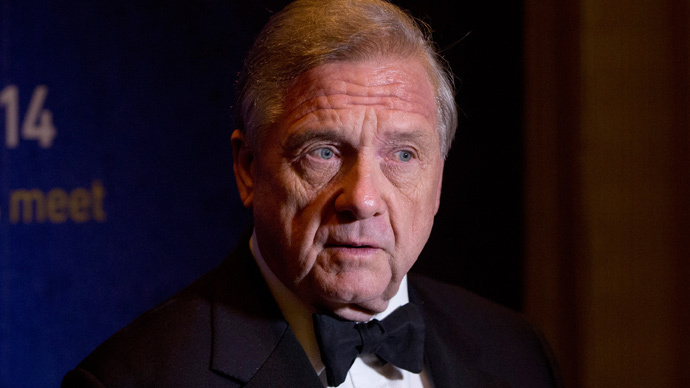 Rake, who is also chairman of British Telecom (BT) and deputy chairman of Barclays Bank, will address 1,000 chief executives and politicians at the CBI’s annual dinner Wednesday evening. “In the months to come, our country will have to make its own choice. A choice between openness and isolation. Between shaping the future or retreating into the past,” he will say. Rake will argue the current alternatives to being in the EU are not “realistic options,” as they would leave Britain with little or no influence and businesses would still need to comply with EU principles. “Norway is the 10th highest contributor to the EU budget, despite not being a member, and it took Switzerland nine years to negotiate and implement partial access to the single market,” he will say. Roughly half of Britain’s exports go to European Union states and are subject to strict regulations set by Brussels. Rake will advocate the UK stays within the EU in order to reform it, rather than a exiting and facing isolation. “Reform will not happen overnight, but by working with our allies on an ambitious, yet achievable, agenda, we can make it a reality,” he will tell the CBI dinner. Nigel Farage, the embattled leader of the eurosceptic UK Independence Party, has hit back at the CBI’s pro-EU comments, saying they had previously argued to join the Eurozone single currency. “They were wrong about that and I think they are wrong about this,” he told the BBC on Wednesday. Farage added it was a "really big myth" that the UK could not trade with the EU if it exited the union.